Governments have always had an interest in controlling the application of health care. Archaeological evidence from 5000 years ago demonstrates that the ancient Egyptian Civilization demonstrates that workers were offered a variety of healthcare benefits, including paid sick days and free visits to physicians. They even had three tiers of providers – state sponsored physicians, religion sponsored “charmers”, and popular folk healers. Skip forward to the very early days of the United States in 1800. Of the existing 16 states, 13 of them had given their state medical societies the authority to examine and license practitioners. By 1803 Massachusetts allowed Harvard Medical School to license its graduates. Soon, other states also began to permit their medical schools to license their graduates creating an "alternative pathway to a medical license encouraging a rapid proliferation of medical schools in the early 1800s." Those who entered the medical schools were not required to have a high school education, and some of the medical schools provided no more than a few months of training before licensing their graduates. Furthermore, most [medical] schools provided no clinical training." “The practice of medicine was deregulated during the first half of the 1800s.” “This period saw the growth of new schools of thought about how to practice medicine. Lay healers, bone setters, botanic Thompsonians, homeopaths, eclectics, and others began to offer medical services, and these ‘new schools’ of medicine rapidly produced practitioners for the masses." The Republic of Texas’ first Medical Practice Act was written in 1837 by Anson Jones, medical doctor, congressman, and the last president of the Republic of Texas. One of the few formally trained physicians in Texas at that time, Jones was licensed to practice in 1820 and received his M.D. degree 7 years later in 1827. Five years later, in October 1832 he renounced medicine. 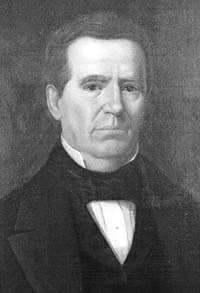 He was elected a representative to the Second Republic of Texas Congress where he helped formulate legislation to regulate medical practice creating the Board of Medical Censors on December 14, 1837 for the purposes of granting licenses to practice medicine and surgery in the republic. By the mid 1800s most of the states in the United States began to repeal their medical licensing laws, the State of Texas followed suit. After about 10 years of operation, the Board of Medical Censors created by the Republic of Texas in 1837 was discontinued by legislative act in 1848. There was no governmental regulation of the practice of medicine in Texas until 1873, 25 years later. By 1849, only New Jersey and the District of Columbia had laws that set out anything close to a governmental regulatory scheme for the practice of medicine. Want more Texas Chiropractic History? Check our ever-growing postings at the History web page under the Media tab of the TCA website.